USPS issued the Lunar New Year: Year of the Ram First-Class Forever stamp today. I was the first one who bought the stamps at a local post office as they brought up the stamps from the back and broke out a brand new pack. 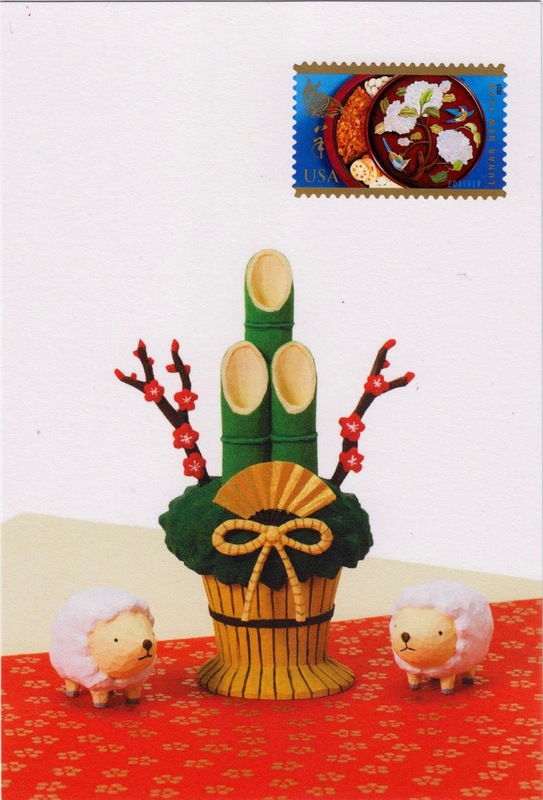 In celebrating the Year of the Ram, which begins on February 19, 2015 and ends on February 7, 2016, the stamp shows a wooden candy tray known as a chuen-hop or Tray of Togetherness. The tray is filled with dried fruits, candies, and other treats to provide a sweet beginning to the new year. After applying the first-day-of-issue postmark, the Postal Service will return the envelopes through the mail. There is no charge for the postmark up to a quantity of 50. For more than 50, customers have to pay five cents each. All orders must be postmarked by April 8, 2015." Outgoing postcard US-3224037 to Malaysia was a the Year of the Ram themed card with a matching stamp.